In 1964, my parents packed up our old Ford and took my brother and me on a cross-country trip from San Diego to Washington, D.C. and back. Part of our trip was along the famed Route 66. Even though I was only 4 years old, I still have vivid memories of that trip and watching the ever-changing countryside. Route 66, dubbed the “Mother Road” by John Steinbeck, was officially decommissioned in 1985. But it has held a special nostalgic place for many of those who traveled it–and even for those too young to have caught a ride on it before it was made obsolete by the more modern interstate highway system. Today, communities along Route 66 are capitalizing on heritage tourism, as more people seek to follow the route of the decommissioned road. Period buildings that have survived from the heyday of Route 66–primarily from the 1930s through the 1950s–are being preserved and restored. Rancho Cucamonga was one of the towns that Route 66 travelers passed through on their journey in California after coming through the desert. Back then, Cucamonga was mostly agricultural, with abundant vineyards and citrus groves, but it also had a few service stations, hotels, and restaurants to serve weary travelers. Today, with its foothill beauty, shopping centers, and pleasant neighborhoods, Rancho Cucamonga has become one of the premier cities of Southern California’s Inland Empire. But in its haste to build itself up, much of its Route 66 heritage has been lost to the developer’s bulldozer. The widening of Foothill Boulevard, which was once Route 66, led to the loss of many historic homes and buildings. I often talk to people who are completely unaware that Route 66 ever ran directly through their city. Now, there is good news: Local volunteers have banded together to save one Route 66 landmark that hasn’t yet been lost. It’s an unlikely target for preservation: a service station that has been closed for more than 40 years. Some residents are old enough to have fond memories of stopping to refuel, pick up a soda from the cooler, and converse with neighbors. Even those of who moved to Rancho Cucamonga after it closed, as I did in 1988, appreciated its charming looks and historical significance. It was not uncommon to hear folks express a desire to see someone refurbish it and turn it into a bakery, flower shop, or coffee shop. But no one ever did. 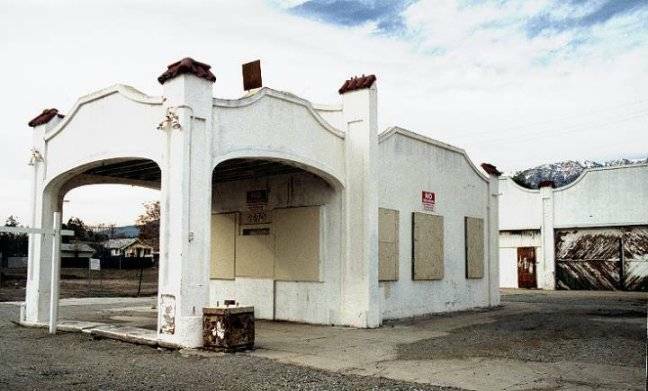 In the meantime, the Cucamonga Service Station continued to deteriorate from neglect and exposure to the elements (the restroom building was gone and the garage, after many years of neglect, collapsed after a storm four years ago). In 2009, the city council voted to designate the station a historic landmark, but the city didn’t provide funding to save it. Its fate was in doubt. So citizens stepped in. In January 2012, Route 66 IECA (Inland Empire California), a non-profit organization, was established with its primary purpose of promoting the preservation of historically significant landmarks along Route 66. Recognizing that it was in danger of being lost forever if action was not taken soon, the organization chose to make the Cucamonga Service Station its first project with the ultimate goal of turning the station into a Route 66 museum. I joined the organization when I saw a sign go up in front of the station announcing the plan. By this time, the property was owned by an advertising company that had erected an electronic billboard on the southeast corner of the lot. They wanted to demolish the building but its landmark status prevented it. Not needing the rest of the lot, the company in 2013 donated title of the property to Route 66 IECA as long as they could keep their sign on the corner. Once title was received, the organization and its volunteers began cleaning up the site and drafting plans for its restoration. Phase one is the restoration of the gas station to its days as a Richfield station. When finished, it will be painted the Richfield colors of blue and yellow, with an original Richfield sign that has been donated. Old glass-topped gas pumps also have been donated to go on the pump islands in front. The station will be part of a Route 66 museum. Phase two involves rebuilding the restroom building and the service garage which will house a community meeting room, the Route 66 IECA offices, an ADA compliant restroom, and more of the museum. But before any of these great plans could become a reality, the site needed attention (and money had to be raised). Fortunately, the underground fuel tanks had previously been removed. But trees had grown in a few places, breaking pavement. A hole in the roof of the main gas station building had allowed water to run down the west-facing wall and rotted all of the wood. Just about the only thing holding the wall up was the stucco itself. The water also eroded the ground under the southwest corner of the building. When workers went to examine the foundation, a shovel disappeared into the hole. But with the help of scores of community volunteers, many of them professional contractors, the building was stabilized. Community interest has been intense since work began and local car clubs have been big supporters, with their members showing up for fundraising activities. People stop by the station to express their delight at the work; some reminisce and look around, others lend a hand in the work, and a few donate old tools and memorabilia to the museum. Today the restoration is moving along nicely. We’re on track to open the main gas station building and museum in July 2015 at an event that will double as the station’s 100th birthday party. David Dunlap is a board member of Route 66 Inland Empire California (IECA). *Photos courtesy of David Dunlap.